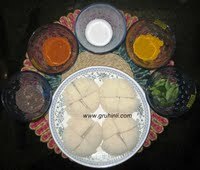 Cut each idli to 4 pieces. Mix Salt, chilly powder and haldi powder in a bowl. Now sprinkle (apply) this mixture on the idli pieces. Heat 1 tea spoon oil in a non stick tava. Add rai, when rai starts spluttering add curry leaves. Now place the idli pieces on the tava, reduce the flame. Add 1 more tea spoon of oil. Fry until until golden brown in a low flame. Crispy Idli Fry is ready..........Serve hot with sauce or any chutney.